At steady state, intestinal stem cells (ISCs) reside next to Paneth cells at the base of intestinal crypts. Homeostasis is maintained, in part, by large numbers of commensal bacteria that stimulate IL-22 production by ILC3s. Commensal bacteria also produce metabolites such as butyrate, which promote the health of Tregs, as well as enterocytes and ILC2s, which maintain antiinflammatory myeloid-derived suppressor cells (MDSCs) and enhance GI barrier function. 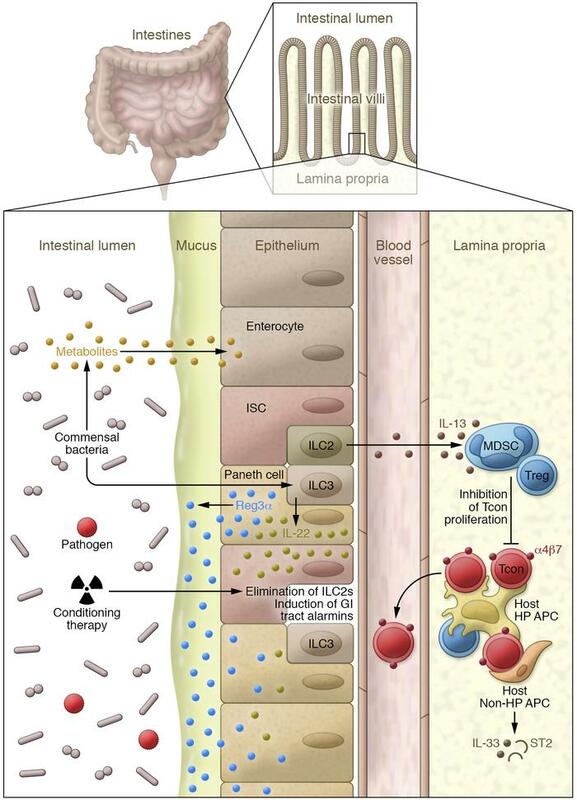 During allo-HCT, ILC2s are eliminated by hematopoietic cell transplant (HCT) conditioning, resulting in diminished antiinflammatory properties in the GI tract. However, ILC3s, which secrete IL-22 that protects ISCs and induces regenerating family member 3α (REG3) in Paneth cells, resist host conditioning. REG3 is concentrated in the mucus that shields the sterile surfaces of enterocytes from potential pathogens present in the intestinal microbiome. After allo-HCT, donor conventional T cells (Tcons) recognize histocompatibility antigens on both hematopoietic (HP) and non-HP APCs. Activated Tcons proliferate and trigger release of alarmins, such as IL-33 and its soluble receptor ST2, from non-HP APCs, such as stromal cells and endothelium; these activated Tcons also express the integrin receptor α4β7, which directs their migration back to intestinal tissue after entering the villus capillaries.